Pinus sylvestris 'Trollguld' is an exceptional, compact, dwarf selection of Scots pine that retains golden foliage throughout the year, although brighter in the winter. 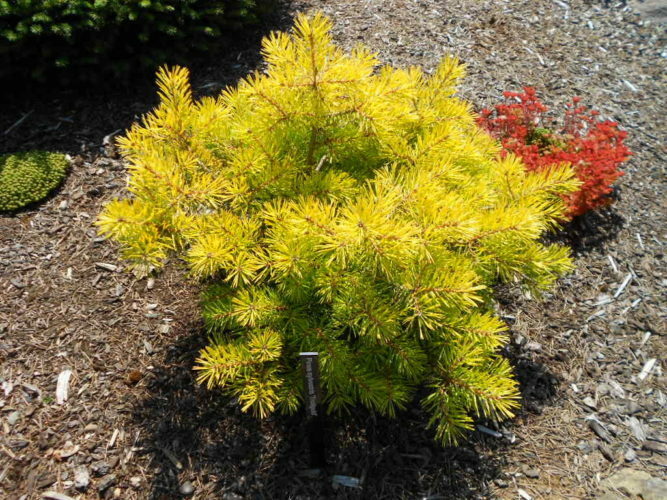 As compared to Pinus sylvestris 'Aurea,' 'Trollguld' has finer, shorter needles. One can expect 10-year growth potential of about 3 feet by 3 feet (1m tall and wide). Older trees will establish a more upright, conical structure after many years if not sheared. Brita and Carl-Erik Johansson selected the original plant from seedlings germinated from seed obtained from the original, wild-grown Pinus sylvestris 'Vargguld.' Sometimes this cultivar is seen misspelled as 'Troll Guld' in the nursery trade. A nicely maintained specimen of Pinus sylvestris 'Trollguld' which can be found at the Jean Iseli Memorial Garden, Iseli Nursery, Boring, OR. This picture was taken in 2012.